Keep tyres safe with a compact and useful piece of kit from Laser Tools. A complete kit, it features a sturdy, GS/TUV approved foot pump, tyre depth gauge, tyre pressure gauge, two tapered adaptors (4mm and 7mm), a brass adaptor for bicycle tyres and a handy needle adaptor for blowing up sports balls. 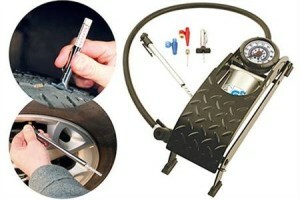 The foot pump includes an easy to read pressure gauge and the tyre depth gauge and pressure gauges are accurate and also easy to read. Excellent value for peace of mind and available now at an RRP of £22.74 + VAT. Call 01926 818196 or go to the website at www.lasertools.co.uk to order your 2013 Laser Tools catalogue free of charge.